We’re pleased to invite you to take part in a special evening in New York City devoted to raising awareness — and funds — to support Iraqi Christians. The guest speaker for this event is the Rev. Elias D. Mallon, S.A., Ph.D., External Affairs Officer for CNEWA and former Vatican representative to the World Council of Churches. He will talk about the struggles and challenges facing Christians in the Middle East. Suggested donation: $60 per person, $20 per student. Want more information? Contact Philip Eubanks (800) 442-6392, Ext 519, or drop him an email at peubanks@CNEWA.org. Join us as we raise funds to provide food, shelter, medicine and other essentials to families trapped in the chaos of Syria, Iraq and beyond. Father Jorge Faraj distributes blessed bread following the celebration of the Divine Liturgy. There are as many as 220,000 Arab-Hondurans. While they represent only 3 percent of the total population of 7.3 million people, they have had an outsized influence on the nation. They are most visible in business and only slightly less so in politics. Centro Social’s president, Juan Canahuati, a textile magnate with numerous other entrepreneurial activities, is considered the country’s top businessman. Coffee exporter and former Industry and Commerce Minister Oscar Kafati’s ancestors immigrated to Honduras in the late 19th century from Beit Jala, a Christian town adjacent to Bethlehem. Former President Carlos Flores Facusse’s mother came from Bethlehem. Arab immigration to Latin America is not unique to Honduras nor are such success stories. To take just two prominent examples: former Argentine President Carlos Ménem (1989-1999) traces his roots to Syria; Mexico’s telecommunications titan, Carlos Slim Helu, the world’s third richest man, is of Lebanese descent. Nearly all Arab-Hondurans claim Christian Palestinian origins, making the Arab-Honduran experience unique. Proportionally, there are more people of Palestinian descent in Honduras than any other Latin American country. ...Today, the country’s only Orthodox parish, the Iglesia Ortodoxa de Antioquena San Juan Bautista in San Pedro Sula, serves more than 200 families. It is pastored by Father Jorge Faraj, a married priest whose grandparents came to Honduras from Beit Sahour, another Christian town near Bethlehem. Father Jorge estimated that about 45 percent of Arab-Hondurans remain Orthodox, including a small number of Hondurans from Lebanon. “But I’m the only Orthodox priest, so it is difficult for me to serve the entire country,” he said. 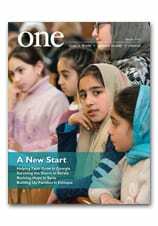 Read more about being Middle Eastern, Central American Style in the September 2006 edition of ONE. In Addis Ababa, Ethiopia today, Commissioner of Ethiopia National Disaster Risk Management, Mitiku Kassa, left, and USAID Acting Assistant Administrator, Thomas H. Staal, right, hold a joint press conference to discuss increased aid for the drought-stricken country. Sister Sophie Boueri, D.C., with one of her young friends at the Creche in Bethlehem. The director of the facility is named Sister Sophie and she is something special. This sister is the embodiment of the protector of little babies and the unwanted. She loves each and every one of the 91 childen cared for at the Creche. But at an age when most people are trying to take it easy, 83-year-old Sister Sophie then took on one more tough job in a tough corner of the world. After nurturing young orphans in the West Bank for decades, she turned her attention to another group of orphans: abandoned elderly women in her native Lebanon. Her order, the Daughters of Charity, has a worldwide charism to help the poor and the marginalized. ONE: Tell me about your work in Lebanon. Sister Sophie: We have 40 elderly women who live in our home. Some are sisters and others are women who have no families or who have been abandoned by their families. We have one doctor and ten staff members. I am the only sister. All the women are Christians, and we accept all rites — Maronite, Orthodox, Latin. We ask only that they be Christian because we take them to Mass every day. ONE: What kinds of activities do you provide for your residents? SS: I take them to daily Mass and to receive the sacraments. I walk with them and I am present with them all the time. Once a patient gets better and they can move, I take them on little field trips to places such as the Marian shrine in Harissa or St. Sharbel Monastery. ONE: What keeps you strong enough to help the elderly when you are elderly yourself? SS: Only him! I promised Jesus a long time ago I would help all people. This is a promise I cannot break. All my life I have seen the poor and I cannot see them without helping them. Do you see how poor they are? And Sister Sophie also is very poor. To support heroic people such as Sister Sophie, serving the poor in Lebanon, visit this giving page. One year ago today, CNEWA lost a beloved member of our family, François Moniz. We asked CNEWA’s national director in Canada, Carl Hétu, to reflect on this unsung hero. François Moniz isn’t known to most people outside of the CNEWA family. He was CNEWA Canada’s first office administrator from December 2004 until his death on 10 May 2015. Back in 2004, François had a full time job in the private sector in administration. But he was out on sick leave, fighting a vicious cancer. After several treatments during the winter and spring of 2004, he was told that nothing had worked and his days were numbered. Knowing this, I brought him back some oil from the tomb of Saint Sharbel in Lebanon. Sharbel was a 19th century monk who was canonized in the 1960’s. Many miracles have been attributed to him. A couple of months later, after using the oil and with many prayers, François learned some amazing news: the tumor was gone. The doctors were shocked. A real miracle! Before he went back to his job, I asked François if he could give me a hand with his free time in laying out the plan to start CNEWA Canada. I had known him for over 25 years, and I knew I could take advantage of his administrative expertise. As we sat discussing how to proceed, it became obvious that he was the perfect person to join me in this new challenge. So I offered him the job and I remember his words that day: “I’ve never worked for the church, but I guess I owe one to God.” He turned out to be a superb fit. The years passed by and CNEWA Canada grew. François was an important part of that growth, and we shared many exciting hours of planning, debating, and evaluating. But then, his cancer reappeared in 2013. This time, we knew that the chances of survival were slim; he needed an operation to remove the tumors. Yet, six months after the surgery, in July 2014, he was back on the job. “You’re back too early,” I told him. He replied, “Not early enough.” He couldn’t stand to be away. François cared. To the end, he was committed to CNEWA’s mission. He did such a good job that I believe God needed François for other purposes. God called him home on 10 May 2015, Mother’s Day. He was 56. François left behind his wife, Edith, two children and three brothers. Thank you, François, for your honesty, objectivity, professionalism and, above all, your friendship.